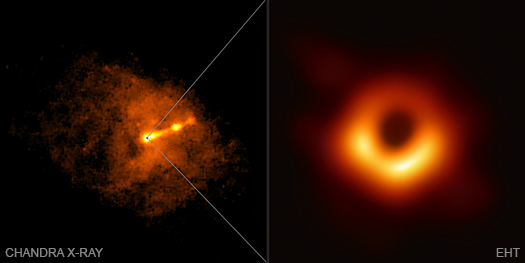 The Event Horizon Telescope (EHT), a network of radio antennae around the globe, has captured the first image of a black hole event horizon. This black hole is located in Messier 87, or M87, which is about 60 million light years from Earth. Chandra has studied M87 many times over its 20-year mission and sees a much wider field-of-view than the EHT. Astronomers have used NASA's Chandra X-ray Observatory to obtain data of Messier 87, or M87, during the April 2017 observing run by the Event Horizon Telescope (EHT). These X-ray data, in combination with the new radio image from the EHT and other observations, will help scientists learn more about high-energy emission and the physics of accretion and ejection at the event horizon, the boundary between what can and cannot escape the gravitational boundary of a black hole. 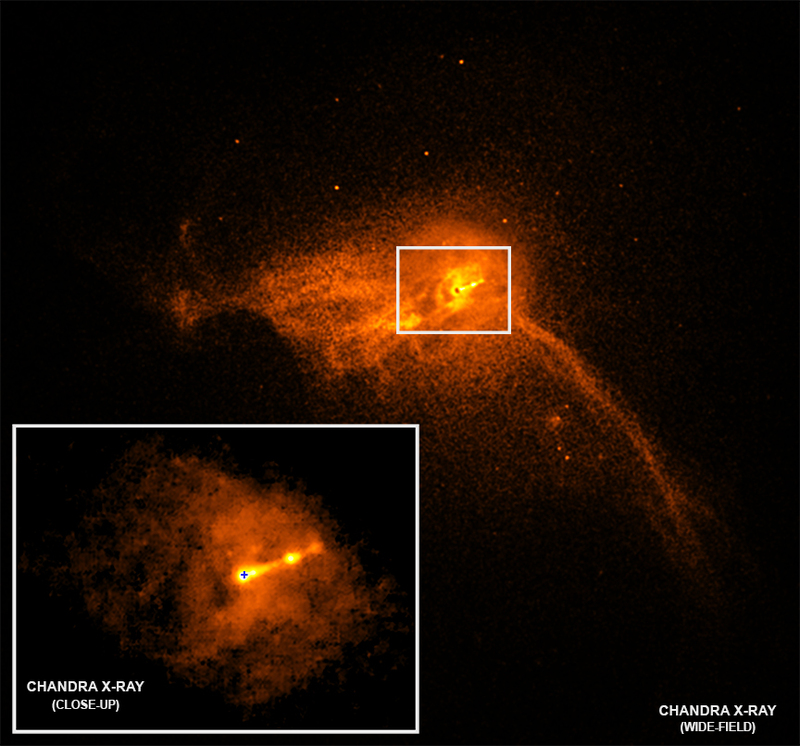 Chandra has a much larger field of view than the EHT, so it can view the full length of the jet of high-energy particles launched by the intense gravitational and magnetic fields around the black hole at M87. This jet, seen in detail from Chandra in the inset, extends more than 1,000 light years from the center of the galaxy. On behalf of the EHT's Multiwavelength Working Group, Dr. Joey Neilsen of Villanova University and his collaborators put in a request for Director's Discretionary Time to observe M87 simultaneously with the EHT, and received nearly 30,000 seconds of observing time during April 2017. Neilsen, Villanova undergraduate student Jadyn Anczarski, and their collaborators used Chandra and NuSTAR to measure the X-ray brightness of the jet, a data point that EHT scientists used to evaluate their models of the jet. Future questions the Chandra data may help explore include: How do black holes accelerate some particles to the very high energies that scientists have seen? How does the black hole produce the spectacular jets that Chandra and Hubble have studied for many years? Can data from Chandra and NASA's NuSTAR observatory help play a role in determining more about the physics in this environment? M87 is an elliptical galaxy in the Virgo galaxy cluster, about 60 million light years away from Earth. For years, scientists have known that a supermassive black hole weighing several billion times the mass of the Sun sits at the center of M87. Surrounding the elliptical galaxy is a reservoir of multimillion-degree gas, which glows brightly in X-ray light. Chandra's studies of this hot gas have given astronomers insight into the behavior and properties of the giant black hole. The Event Horizon Telescope is an international collaboration whose support includes the National Science Foundation. NASA's Marshall Space Flight Center in Huntsville, Alabama, manages the Chandra program for NASA's Science Mission Directorate in Washington. The Smithsonian Astrophysical Observatory in Cambridge, Massachusetts, controls Chandra's science and flight operations. Scale Close-up inset image is 1.75 arcmin (about 25,000 light years) across. Wide-field image is 11 arcmin (about 190,000 light years) across. 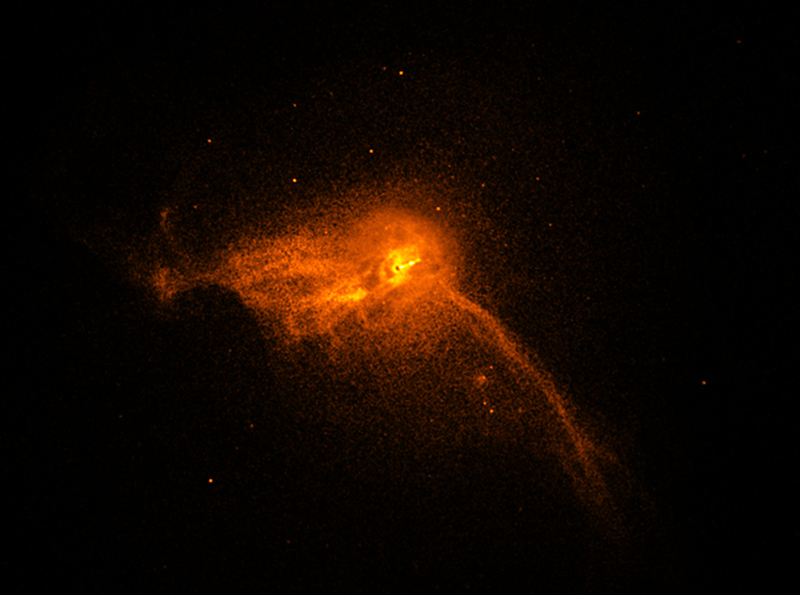 Coordinates (J2000) RA 12h 30m 49s | Dec +12° 23´ 28"
A supermassive black hole at the center of galaxy M87. About 60 million light years from Earth. X-rays from Chandra X-ray Observatory. Close-up inset image is about 25,000 light years across. Wide-field image about 190,000 light years across.